BlackRock caused a stir in 2009 when it announced its intention to increase the practice of crossing trades. It signaled to the street that they were sufficiently large to find counterparties within and among their many portfolios and clients. They would no longer rely so greatly on the efforts of outside brokers. Brokerages recoiled in defense and BlackRock was forced to say that it would continue to be a big customer of the street. Nonetheless, their intention hung in the air. It wasn’t that crossing trades would comprise a new development. Asset managers have crossed trades before and in great number for years. Why should an investment manager go to a brokerage to sell a security when another of the firm’s portfolios or clients would like to buy it? Cross the trade, and you don’t have to pay a brokerage fee. The practice lowers costs and lowers risks by limiting one’s reliance on the street for pricing, market intelligence, and execution. BlackRock’s scale, however, suggested that something might be different this time. But was it? BlackRock’s proposal represents the slow realization of a long-standing trend in the securities market – the systematic and persistent diffusion of the market center. In practice, it has meant a progressive shift from transactions through a fully regulated cartel at the core to a spontaneous and dynamic arrangement of counterparties. In fact, BlackRock’s proposal today bears the same signature as the odd-lot controversy in 1975, when Merrill Lynch proposed executing odd-lot trades on behalf of their clients. But it differs in one important respect. Rather than a brokerage house, it’s the investment manager that is driving the change: a principal, rather than an agent. Merrill Lynch approached the New York Stock Exchange in 1975 with a simple proposal. They wanted to execute odd-lot trades off the exchange. Odd-lot trades comprised orders of fewer than 100 shares. Brokers would typically pass these to floor specialists, who would bundle them in round lots and execute them on behalf of a Merrill Lynch client. Merrill proposed to match odd-lot trades with buyers from among their existing clients and execute them at a lower cost than otherwise. The specialists were terrified. Merrill’s proposal would shift transactions away from the specialized floor traders, such as Carlisle DeCoppet, for example, the reigning specialist in odd-lot trades. Odd-lot trading comprised less than 5% of trading on the exchange, but the members feared the change would undermine a carefully constructed cartel that, through policy and procedure, directed the vast majority of trades to the floor of the exchange for execution by member firms. Chris Welles, writing in New York Magazine, 20 October, 1975, laid out the stakes: “Carlisle DeCoppet’s monopoly would be destroyed and its profits all but wiped out if Merrill Lynch goes ahead with its plan, for Merrill’s 1.5 million customers account for 26 percent of Carlisle’s business.” Merrill Lynch would effectively create a mini-stock exchange, separate from the NYSE. The NYSE had only just been compelled by the SEC to no longer fix brokerage rates in May. The exchange forfeited the 183 year practice on May 1st, 1975, a day that would come to be known as May Day. Members, having lost the organizing influence of the cartel’s discipline, quickly found themselves in a price war, undercutting each other dramatically. With it emerged the first generation of discount brokerages. Many rules, however, remained, but the exchange was losing power. The debate had moved to Rule 394, which had been designed to limit off-floor execution of trades. Though it did permit them if the off-floor price was better than the floor price, the spirit of the rule was intended to keep as much execution on the floor as possible: “Even if Merrill Lynch isn’t formally breaking 394, they are opening up a wedge. They are violating the spirit of 394,” said Harry Jacobson, a specialist on the floor at the time and then head of the Association for the Preservation of the Auction Market, a 700-member strong association of specialists with an interest in floor trading. Donald Weeden likened it to the Blackout Rule for sports-fans, “league-sponsored rules erected to assure a full-house for club owners.” Welles had just published The Last Days of the Club, in which he outlined the decline of the then stalwart Wall Street firms and subsequent rise of their inheritors. The title alone told the story, but the market for exchange seats made it tangible. The price for an exchange seat dropped in one month from $125k to $65k on the news of Merrill’s plan. Merrill Lynch would get its way. May Day had weakened the exchange. Merrill’s proposal did not violate 394. It saved their customers money, and it uncovered the swollen and unsympathetic features of the cartel that dominated equity trading through the NYSE. The securities market would begin the systematic and persistent diffusion of the market center in favor of the edge. 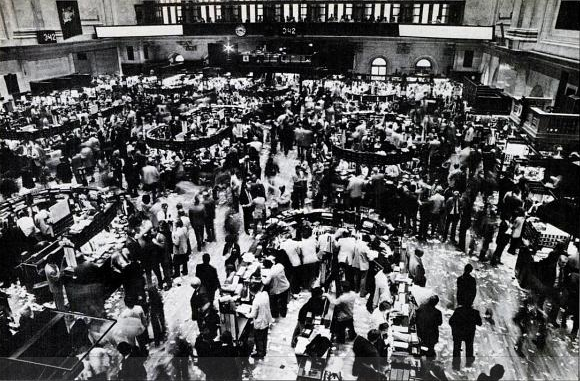 In 1975, the market moved from the floor specialists at the center to the investor-facing brokers, such as Merrill Lynch, at the edge. The floor lost its monopoly and other firms, such as Merrill Lynch, other exchanges, or agents would emerge as competitors. Almost thirty-five years later, Larry Fink would voice a similar proposal, but it would come from an asset manager, not a broker or an exchange: a principal, not an agent. In September 2009, Fink announced that BlackRock would organize a system to cross trades within its massive asset-base for the benefit of the firm and its clients. He introduced it in terms of “trading friction cost” and lamented, “we need to make sure we’re not being taken advantage of.” Just like Merrill in the odd-lot controversy, BlackRock would cross-trades to benefit their clients: “our clients are going to make more return.” Fink would go on to say, “There’s no question, you have seen huge profitability in some of these institutions. The widest bid-ask spreads are in fixed income — the more opaque the market, the more money the market makers are making.” BlackRock wasn’t just interested in equities, it was interested in fixed income and perhaps other markets as well. BlackRock would raise the specter of crossing trades again in late 2010. The FT quoted BlackRock president, Rob Kapito, on 28 December 2010: “We are developing the technology in-house to offer better value by lowering trading costs.” BlackRock’s push was quickly compared to the ill-fated E-Crossnet collaboration between Merrill Lynch Investment Managers and Barclays Global Investors in 2000. The collaboration aimed to provide a buy-side only crossing network to circumvent traditional brokers. E-Crossnet was part of the same shift from the center of the marketplace that began in 1975, but it had more in common with existing ECNs of the time. It failed to gain traction and was sold to ITG who combined it with the POSIT dark pool – effectively as an external agent. BlackRock, however, would operate as a principal, crossing trades across its vast collection of portfolios. BlackRock would effectively create a mini stock-exchange, separate from the NYSE and separate from everyone else, entirely, and entirely different than E-Crossnet. E-Crossnet relied on a network effect across buy-side clients. The resulting pool of liquidity would provide low-cost transactions among the participants, but someone still needed to run it. It needed an agent, so it went to ITG. BlackRock’s network relies only on the ability of BlackRock Solutions to design and develop a crossing system that will sit within BlackRock’ trade processing and order management system. BlackRock will run it, and they have sufficient scale to make the returns on those investments economical. Nonetheless, it would not be surprising to see BlackRock license the system to third parties for others to implement in their order flow and trade processing systems, just as they do with the Aladdin system for risk management. It would not be E-Crossnet Revisited. It would be licensed. The first call for liquidity in BlackRock’s system won’t be to a broker. It will be to BlackRock. And perhaps the first call for Fidelity or Capital Research or AllianceBernstein won’t be to a broker. It will be to themselves, through a clever piece of software written by BlackRock solutions and part of the overarching trend of the market to decompose its center, drive execution toward the edge: from the select membership of the NYSE cartel to a cluster of brokers and other markets, to dark pools and now to the underlying investors and owners of the securities, each linked by pools of liquidity.